Last week at the boot sale I found a piece from my favourite vintage 80s designer Hunza. As you know I found a neon green skirt last month by Hunza and I also have a couple of their vintage bodycon LBDs too. I've dressed it down here, with a grey cami tee, black leather biker jacket and my new black and silver gladiator sandals from Matalan-which I've just noticed are in the sale now, definitely a bargain for £10!! The skirt was a total bargain for £1-it's great to thrift something which is a vintage favourite. What has been your favourite vintage or thrift find lately? 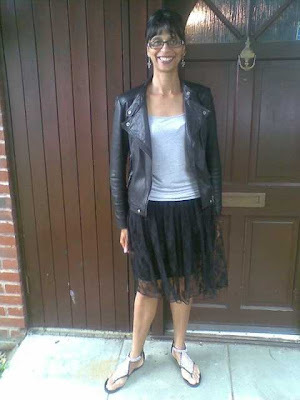 Ahhh - black leather, biker chic and black lace - a perfect combination! £1 for the skirt!! Wow! Sharon, love the entire outfit; it's a feminine take on rock and roll a la Joan Jett! My most recent thrift purchased was yesterday; a Talbots silk and cotton purple skirt for $5.00 at my Salvation Army store in Ft Lauderdale. This is such a good look - a little Joan Jett, a little bit Madonna in Desperately Seeking Susan. I just love the clash of black leathe and lace, and of course the 80s vibe. I love the jacket! Great post :) You have such an inspiring blog, maybe you want to follow each other? 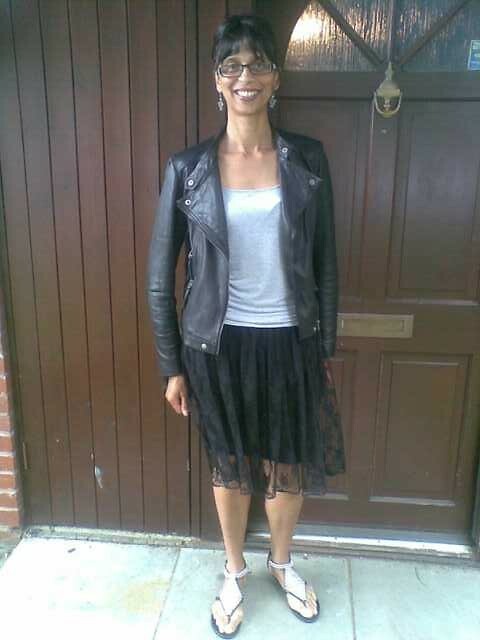 Oooh, I like this combo - leather and lace always works. And what a steal! Hope you had a lovely weekend. I love the leather jacket- Yummy ! Lace and leather - of course look great together. Finding the skirt is made by your fave designer is the best part. Wow, you must do your thrifting in some magical places :) You so often turn up great pieces, But of course it's also testament to your beady eye. I haven't thrifted in a while actually. A few months ago I found a gorgeously well-fitting Bench top for a quid! Some places really don't know what they have, or they just want the turn over to be high so they don't mind charging a pittance - I'm not sure which it is. I know that price tends to depend heavily on area.. Anyway, I'm going off on a major tangent now so I'll wrap this up. The skirt is fabulous. You get such great bargains. I went shopping in Delhi over the weekend and found some great stuff too. Great look. That jacket is really excellent. *love* that biker jacket, really really like how it works with such a feminine skirt. You do have lovely legs it has to be said! You are welcome to pop along to the "boudoir" anytime, I really hope you will make it before I have to surrender the room, I'm sure you'd find a few things that you'd like to wear or perhaps just stock up on some more attire for your own market selling activities.